Pastor Samuel Babatunde, 77, has been arrested by the Police in Ogun State, in connection with suspected human parts buried in his church. He was arrested alongside with one suspected serial kidnapper, Jeremiah Adeola (32) and a 43-year old herbalist, Haruna Afolabi. The cleric is said to be the founder of Cherubim and Seraphim Church, Itedo Isinmi, Ayo Parish, Egan Road, in Iyesi Area of Sango-Ota. The State Commissioner of Police, Ahmed Iliyasu, said that the discovery followed the arrest of Adeola, last Sunday. Iliyasu while parading the church founder said that Adeola confessed that the pastor was the receiver of children kidnapped by him while Afolabi, was among the suspects, who allegedly buried the human parts at the entrance of the church. He said: “The floor of the church was dug as described by Adeola, and parts suspected strongly to be human parts were dug out there in.” Iliyasu promised that the command will carried out forensic investigation into the case. 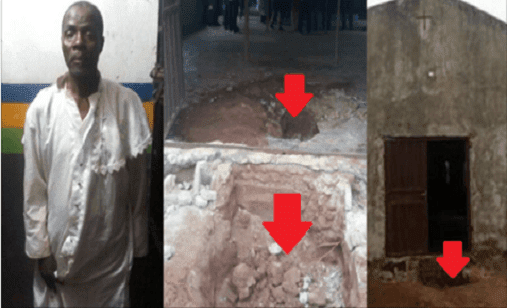 However, the arrested pastor denied the allegation, saying that a pig was buried alive inside the church contrary to claims that human parts were buried there. Babatunde said the action was done so that it could bring prosperity, good fortune and comfort to members of the church. He told newsmen that he regretted his action, saying that he met Adeola at a prayer mountain in Ibadan, and never knew that he had any ritualist dealing with the alleged serial kidnapper, whom he accused of mental infirmity. Adeola, however, stood his ground that the pastor was the receiver of some kidnapped children and that he (Babatunde) paid him N50,000 each for two children.